Would you like to customize your own resource…? Add your favourite content – labs, worksheets, activities, notes, review or even web-based content – web links, videos etc. Your own personal book. Drop us a note and lets get started! A busy life both in and out of school that included a new family and supporting the technology plan in the school, Physics teacher Bruce Currell from Dover Bay Secondary near Nanaimo, British Columbia wanted to take some of his key teaching materials and place them in his Physics book. Using our customization process Bruce has been able to insert PhET simulations into the book along with direct mobile links to key digital content using QR codes. Now students have can use both the print materials and their mobile, Internet ready, devices to access customized content when they need it within their own timelines. Across North American everyone teaches his or her Advanced Placement course in a slightly different manner. Sure all the outcomes are covered and students are prepared for the exam, but no book ever seems to work just right. Kathy Soave from The Branson School near San Francisco is working to solve that problem. Using AP Chemistry 1 and 2 she realigned the custom, 100% aligned to the AP Chemistry curriculum content to match her teaching. Now the kids know exactly where they are on any given day. Check out her Table of Contents. And notice they selected a different image for their book’s cover. That’s a first for K – 12 Education! 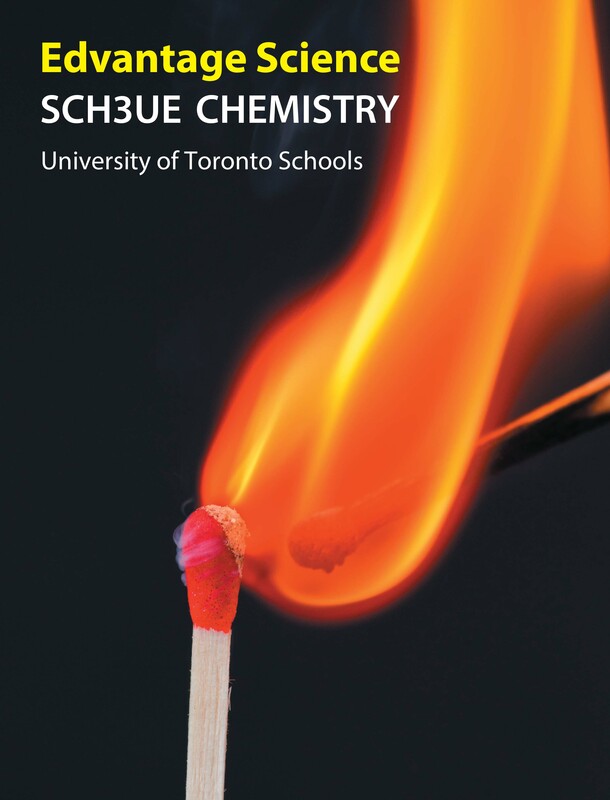 Science is a big focus at University of Toronto Schools and the Science Department has high expectations of their students taking both Senior Chemistry and AP Chemistry. The Edvantage Science Chemistry and AP books provided the perfect solution for the Department. Working collaboratively the Department divided the Chemistry courses between different faculty members and each crafted their book based on the curriculum expectations and outcomes. Not only do the students receive a custom learning solution, the Chemistry teachers are now collaboratively working on a path to excellence in all aspects of their program. You can see an example of the Table of Contents here. The Chemistry teachers at St Michaels University School (SMUS) are always providing opportunities for their students to reach their potential. Sometimes this means extending the curriculum in a way that enriches their students learning experiences. Located in Victoria, British Columbia, SMUS has added the gases unit from AP Chemistry 1 to their grade 11 Chemistry course. Now all students have an opportunity to have an introductory exploration of gases. A customized learning experience that will hold them in good stead for their future post-secondary classes. Take a mobile, internet enabled device, one innovative teacher and blend in QR codes and you have the recipe for a successful implementation of print and digital resources in the classroom. AP Chemistry teacher Janet Whitney has done exactly this with her customized Edvantage Science AP 2 book. She has placed 27 QR codes that point directly to resources she feels work best for her students. Now she can deliver print and digital support at any time, any where her students are studying. And check out our blog posting on customization.